The UN cultural agency, UNESCO has awarded its World Press Freedom Prize to imprisoned Egyptian photojournalist Mahmoud Abu Zeid, despite criticism from the government of Abdel Fattah el-Sisi following the announcement last week. The president of the independent jury that selects the award's recipient, Maria Ressa, said the honour pays tribute to the "courage, resistance and commitment to freedom of expression" of Abu Zeid, who is more common ly known as Shawkan and who has been in jail since August 2013. Arrested while covering deadly clashes between security forces and supporters of the deposed president, Mohamed Morsi, in Cairo, he is potentially facing the death penalty. While some rights groups hope the prize will pressure the Egyptian government to free the dozens of journalists currently imprisoned in the country's jails, they say there is little sign of this happening. "We know that this award has had an effect in the past," Scott Griffen, the director of the International Press Institute (IPI), told Al Jazeera. 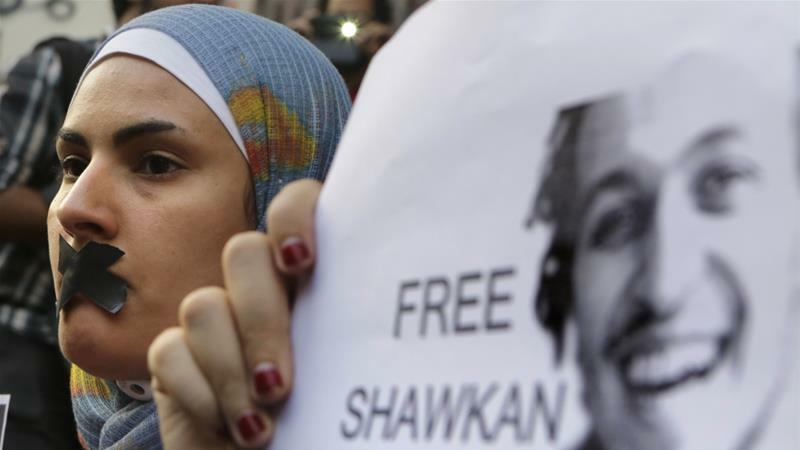 "[Shawkan] is a symbol of an everyday journalist in Egypt who is unable to carry out his job and who has been held in terrible circumstances in the past few years." Griffen cautioned that change seems to be far off. So how has Egypt's once-robust media industry ended up so endangered? On World Press F reedom Day, Al Jazeera looks at the threats facing Egyptian journalists. Rights groups have reported an unparallelled crackdown on Egypt's media in recent years and say there are signs it is getting worse. "Compared to a year ago, the censorship feels tighter, the control of the information â¦ is higher," Sophie Anmuth, a Paris-based researcher with the Middle East desk at Reporters without Borders (RSF), told Al Jazeera. According to Anmuth, more than 20 journalists were arrested in the six months preceding the country's presidential elections in March of this year. Anmuth, who noted that some have since been released, said that at least a dozen of these were arrested because of their work. Rights groups believe the arrests were part of a campaign to crack down on dissenting voices in the run-up to the elections. In February, a top Egyptian legal official called for ac tion against media organisations "hurting national interests" by spreading false news, the Associated Press news agency reported. The government also announced telephone hotlines for reporting false news, while Sisi warned the media that speaking against the military or police was "high treason". The government also ramped up online censorship; at least 496 websites were blocked between May 2017 and February 2018, according to the Freedom of Thought and Expression Law Firm (AFTE). While government monitoring is usually high around election time, Anmuth said tension remains. "The level of distrust against journalists propagated by the authorities, whether from the government or the president, has reached heights it does not regularly reach in Egypt," she said. "It is not something entirely new that we are seeing now but the level, or continuity, is new." At least 32 journalists are currently deta ined and 22 of those are held without charges, according to RSF. In 2011, during a wave of uprisings across the Arab world, the Egyptian people ended the 30-year rule of President Hosni Mubarak. The following year, Morsi became the country's first democratically elected president. But a little over a year later, he was deposed by the military in a coup. "The counter-revolution started an unprecedented campaign of lies," Yehia Ghanem, an exiled Egyptian journalist, told Al Jazeera. "Character assassinations and disinformation like we have never seen before. It was really like a runaway train." Ghanem, who worked for the country's Al Ahram newspaper and had served as a war correspondent for 20 years, was himself put on trial. Media free dom stalled, he said, when in the wake of the revolution, partisan news outlets began campaigning against each other. "Talk[ing] about press freedom in Egypt, it's a nightmare," Ghanem says. Following the military coup, journalists and news outlets affiliated with Islamist-leaning groups were shut down, according to analysts. Within two months following the coup, a total of five journalists were killed, 80 journalists were detained - although most were later released - and 40 newsgroups were attacked by law enforcement, according to RSF. According to Ghanem, the government began buying into most media outlets through second-party companies. Unlike past administrations, which had used more covert tactics to influence the media, "the state, represented by the military intelligence and the general intelligence, jumped into the market themselves, the market of the media, openly", said Ghanem. "Now they own 95 per cent of the TV channels." The consequences of this are far-reaching, Ghanem says. "[The Egyptian] people are being targeted on an hourly basis by media that has offers nothing but disinformation campaigns."